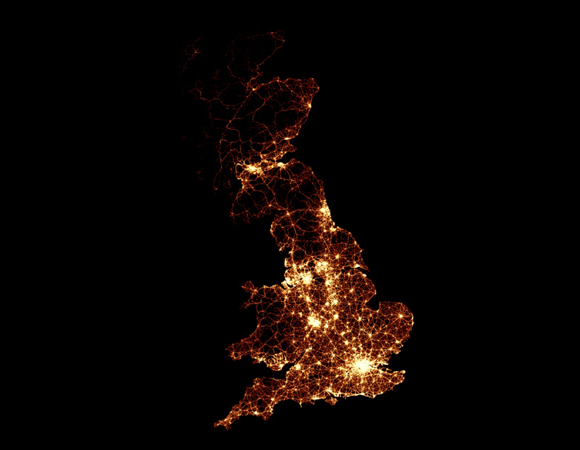 A BBC visualization maps every traffic casualty in the UK between 1999-2010. The web-like patterns of British auto travel in the visualization below are quite beautiful — that is, until you discover it’s a map of traffic casualties. The visualization depicts the locations of more than two million road crashes in the UK between 1999 and 2010. Each light point on the map represents a collision that resulted in a casualty; the brighter the light, the more frequently collisions occurred in that spot. Screenshot from the BBC’s traffic accident visualization. See the full version. The original map was created by the BBC and can be viewed here. Accompanying the map is a video animation of the crash data, along with more detailed information about particular areas. Visitors to the site can enter their address information to see local crash data, broken down by time and by vehicle type.